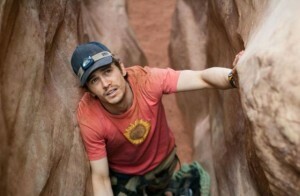 James Franco stuggles to survive in 127 Hours. 20th Century Fox Home Entertainment released the excruciating adventure drama 127 Hours, starring James Franco (Howl), on Blu-ray and DVD on March 1, 2011. Nominated for six Academy Awards, including Best Picture and Best Actor (Franco), the thriller movie was directed by Danny Boyle (Trainspotting), whose last film, 2008’s Slumgdog Millionaire, is no stranger to the Academy Awards, having picked up eight Oscars in 2009, including trophies for Best Picture and Best Director. Based on true events written in the book Between a Rock and a Hard Place , 127 Hours follows Aron Ralston (author of the book), a dare-devil outdoorsman who gets trapped under a boulder while canyoneering alone in the Utah mountains. As hours turn into days, Ralston embarks on a personal journey in which he relies on the memories of family and friends — as well as his own courage and ingenuity — to turn adversity into triumph. But Ralston’s harrowing story of survival comes with a price. Amber Tamblyn (TV’s Joan of Arcadia) and Kate Mara (Ironclad) also are in the movie. 127 Hours is available on Blu-ray and DVD for the suggested retail prices of $39.99 and $29.98, respectively. Check out the full list of Oscar nominees and winners on DVD and Blu-ray.